This evergreen oak tree is a wonderful addition to the garden where screening or year-round interest is required. The dark-green, glossy foliage is similar to that of a holly tree, hence the common name Holly Oak (or Holm Oak). The spiny, evergreen leaves provide a brilliant plain foil for other plants. Young green autumn acorns adorn Quercus ilex and mature to a dark-red before falling. The acorns are popular with wildlife such as squirrels, whilst the spring catkins are visited by bees and the evergreen canopy provides shelter to birds. Eventually growing into a large, rounded tree, this variety of Oak will reach 10 x 6 metres in 20 years. 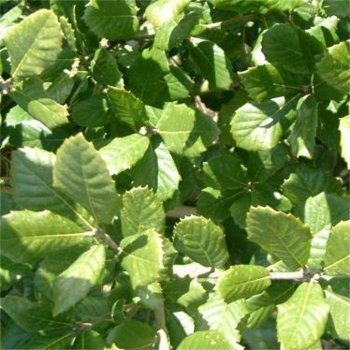 Quercus ilex will tolerate exposed coastal or inland positions and as it is also tolerant of salt-spray, it is ideal for using as an evergreen windbreak in coastal gardens. It is happy in both full sun and dappled shade and in all but very wet soils. This tree is extremely useful and tough. Our pot grown Evergreen Oak trees can be planted at any time of the year. Prepare the planting site by removing all weeds and grass within a metre of your desired planting hole. Dig a square hole as deep as your root mass and approximately 2x as wide. To help your tree establish more effectively, we advise applying root grow (sprinkle in the hole for pot grown trees), especially if you have poor soil. Gently loosen the roots and place into the planting hole. Using 50% of the original soil and 50% compost, fill in the hole and firm around gently. Make sure not to bank the soil up around the collar of the tree. We recommend using a tree staking kit and if your area is prone to rabbits, a rabbit guard. For further information visit the advice section. If you’re planting Holm Oak in spring, summer or dry weather, water well and regularly for the first few months. We stock a range of irrigation kits to help. Keep an eye on young trees and increase watering if there are extended periods of hot or dry weather. If you’re planting in autumn, you may only need to water a little. Evergreen Oak trees develop a well-balanced canopy with little help from us. Established oaks only require tidying up, by removing any crossing or damaged branches. You can encourage young oak trees to form a clear trunk by pruning the lower branches. This will help to raise the canopy and improve the overall look of the tree.